Belize is a country on the eastern coast of Central America. It is the only country in Central America whose official language is English, though Belizean Creole (Kriol) and Spanish are also commonly spoken. Belize is bordered on the north by Mexico, on the south and west by Guatemala, and on the east by the Caribbean Sea. Its mainland is about 290 km (180 mi) long and 110 km (68 mi) wide. With 22,800 square kilometres (8,800 sq mi) of land and as of 2014 a population of 340,844, Belize has the lowest population density in Central America. The country’s population growth rate of 1.97% per year (2013) is the second highest in the region and one of the highest in the Western Hemisphere. Belize’s abundance of terrestrial and marine species and its diversity of ecosystems give it a key place in the globally significant Mesoamerican Biological Corridor. A combination of natural factors—climate, the Belize Barrier Reef, over 450 offshore Cayes (islands), excellent fishing, safe waters for boating, scuba diving, and snorkelling, numerous rivers for rafting, and kayaking, various jungle and wildlife reserves of fauna and flora, for hiking, bird watching, and helicopter touring, as well as many Maya ruins—support the thriving tourism and ecotourism industry. It also has the largest cave system in Central America. In Belizean folklore, there are the legends of Lang Bobi Suzi, La Llorona, La Sucia, Luguchu Ellis, Tata Duende, Chatona, X’tabai, Anansi, and the cadejo. Most of the public holidays in Belize are traditional Commonwealth and Christian holidays, although some are specific to Belizean culture such as Garifuna Settlement Day and Baron Bliss Day. In addition, the month of September is considered a special time of national celebration. Besides Independence Day and St. George’s Caye Day, Belizeans also celebrate Carnival during September, which typically includes several events spread across multiple days. In some areas of Belize, however, Carnival is celebrated at the traditional time before Lent (in February). Belizean cuisine is an amalgamation of all ethnicities in the nation, and their respectively wide variety of foods. 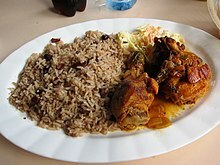 It might best be described as both similar to Mexican/Central American cuisine and Jamaican/Anglo-Caribbean cuisine. Breakfast typically consists of bread, flour tortillas, or fry jacks that are often homemade. Fry jacks are eaten with various cheeses, refried beans, various forms of eggs or cereal, along with powdered milk, coffee, or tea. Midday meals vary, from lighter foods such as rice and beans or beans and rice with or without coconut milk, tamales,“panades” (fried maize shells with beans or fish), and meat pies, escabeche (onion soup), chimole (soup), caldo, stewed chicken and garnaches (fried tortillas with beans, cheese, and sauce) to various constituted dinners featuring some type of rice and beans, meat and salad or coleslaw. In rural areas, meals are typically more simple than in cities. The Maya use maize, beans, or squash for most meals, and the Garifuna are fond of seafood, cassava(particularly made into cassava bread or Ereba) and vegetables. The nation abounds with restaurants and fast food establishments selling fairly cheaply. Local fruits are quite common, but raw vegetables from the markets less so. Mealtime is a communion for families and schools and some businesses close at midday for lunch, reopening later in the afternoon. Steak is also common. Punta is by the far most popular genre of Garifuna music and has become the most popular genre in all of Belize. It is distinctly Afro-Caribbean, and is sometimes said to be ready for international popularization like similarly-descended styles (reggae, calypso, merengue). Brukdown is a very popular modern style of Belizean music related to Calypso. It evolved out of the music and dance of loggers, especially a form called buru. Reggae, Dancehall, and Soca imported from Jamaicaand the rest of the West Indies, and Rap, Hip-Hop, heavy metal and rock music from the United States, are also popular among the youth of Belize. The major sports in Belize are football (soccer), basketball, volleyball and cycling, with smaller followings of boat racing, track and field, softball and cricket. Fishing is also popular in coastal areas of Belize. The Cross Country Cycling Classic, also known as the “cross country” race or the Holy Saturday Cross Country Cycling Classic, is considered one of the most important Belize sports events. This one-day sports event is meant for amateur cyclists but has also gained a worldwide popularity. This cycling event in Belize has seven rider categories based on rider rating, age, and gender. Action-packed and thrilling, this most interesting sporting event allows for the participation of tourists and visitors alike from all over the world. The cycling routes offer views across the resplendent greenery of the forest areas and the meandering rivers. This makes the event even more popular among the tourists. Average rainfall varies considerably, from 1,350 mm (53.1 in) in the north and west to over 4,500 mm (177.2 in) in the extreme south. Seasonal differences in rainfall are greatest in the northern and central regions of the country where, between January and April or May, less than 100 mm (3.9 in) of rainfall per month. The dry season is shorter in the south, normally only lasting from February to April. A shorter, less rainy period, known locally as the “little dry”, usually occurs in late July or August, after the initial onset of the rainy season.